An integrative and revolutionary way to treat your animals, combining holistic and natural medicine with the best of modern science. Dr. Barbara Royal is a passionate, dedicated, and innovative veterinarian with a unique approach to medicine. Her patients have included countless different species from German shepherds at her private practice, to baby owls in the wild, to zebras in the zoo. Her clients are the humans who live for their pets, much like she does. Her ability to lend a voice to sick or injured animals and carry out the best treatment for them is unmatched. An expert diagnostician with a background in zoo and wildlife medicine, Dr. Royal has learned that adhering to the teachings of Western medicine is often not the best way to fully cure her patients. With the clinical experience to know when to use surgery, medications, and alternative methods, plus an observant and empathetic understanding of the evolutionary needs of her patients, she individually tailors the Royal Treatment to ensure that each pet (and owner!) lives as happily and healthfully as possible. The knowledge she has gained from wild animals gives her valuable insight into the cat in your kitchen and the dog in your living room. Our pets have all evolved from wild species and adapted to domestic life in many ways, but their natural characteristics are genetically fixed. In order for our pets to meet their full health potential, we must be mindful of these natural nutritional, emotional, and physical needs. Applying common sense in this way, along with the support of medicine, nutrition, elements of Eastern medicine, and physical rehabilitation, fosters an animal’s natural inclination toward optimal health and immunity. There is no placebo effect in animal medicine, and Dr. Royal has seen amazing results with her integrative approach, time and time again. A must-have for all pet owners, these pages shimmer with ingenious advice, insight, and scientific originality. But most of all, a veterinarian with heart comes through in every word. 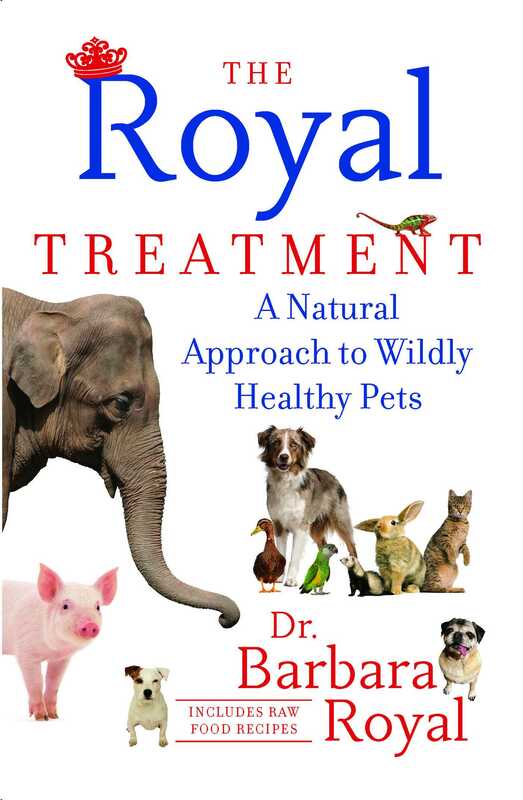 Dr. Royal empowers animal lovers to lift their pets into a realm of natural health and happiness that will be palpable from shiny coat to bouncy step. Author Photo (jpg): Barbara Royal Dr.